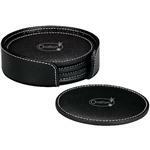 NuBuc Custom Suede Leather Coasters. 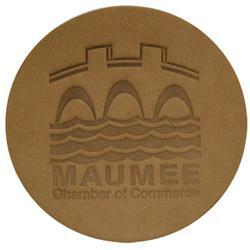 An age old favorite, these custom suede coasters are also very thick and durable. The deep debossed copy contrasts beautifully to the natural tan tones of suede. 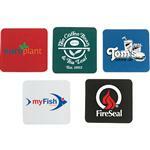 A classic and best selling coaster! Setup Charges: $55 for a blind deboss as shown. Production Times Available: 15 working days with a paper proof. Inquire for free rush production. Typical Imprint Area(s): 3" diameter.